The days of a social media manager getting by with a simple understanding of how to schedule posts in advance or knowing all about the best hashtags is over. Today skilled social media managers have to be on top of current trends and understand what will effectively work for a brand. Also, they must have an in-depth understanding of many, if not all social media channels and an impressive toolkit that will help them analyze all the data. When companies hire a social media manager, there are certain traits they look for. Whether you’re looking to become a social media manager or are a company who is hiring one, it’s a good idea to keep these qualities in mind. Both branding and marketing experience is an essential aspect of any social media manager’s job, which is why Kruse Control Inc. says that businesses look for this type of job experience when hiring. Social media is equal parts marketing, branding, sales, PR/crisis management, reputation building and data analysis. I can’t tell you how many employees I’ve met who’ve been put in charge of a company’s social media that have ZERO branding and marketing experience. Social media is simply a channel(s) with which to engage customers and deliver key messages that are relevant to their needs, concerns and challenges. Experience level is evident in your message and your results. Staying on top of the trends and being innovative is another trait companies look for when hiring a social media manager. It’s up to you to think outside the box and come up with the best marketing strategies that will help improve business. Sendible Insights also offers an example of what innovation is all about. Nothing stays the same for long in the world of social media. We’ve seen it with Facebook Live, Instagram Stories and native GIF search on Twitter, and those capabilities were launched between 2016 and 2017 alone. Every day brings a new #TrendingTopic, you might say. The best social media managers keep on top of these budding trends and see opportunities to capitalize on them. For example, how does National Pizza Day fit in with your business? If your organization has absolutely no direct connection to pizza, it might seem like it doesn’t. 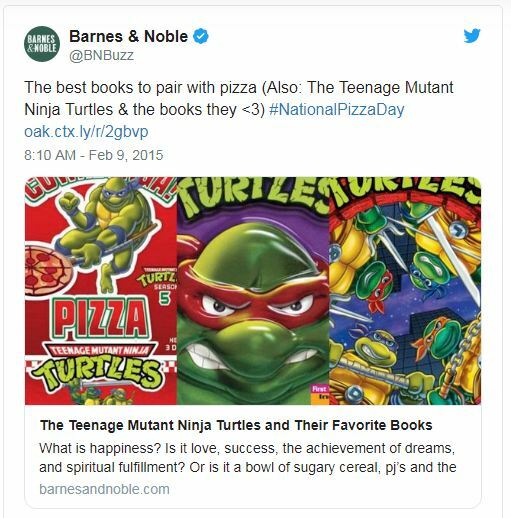 A good social media manager may share an image related to pizza or even create a native meme to take advantage of the trend, but a great social media manager would try to make it relevant to their organization like Barnes & Noble. This isn’t to say that everyone needs to jump on board with every trending topic on Twitter (you can get lost in a wormhole of food related ‘holidays’). The point here is that thinking out of the box gives you an edge, and can hugely work to your advantage. Innovation comes in many shapes and forms, it should be a part of a social media manager’s day to day thought process and have a role in overall growth strategy. Buffer author Brian Peters mentions three tips from a blogger named Marc Andreessen. His tips discuss why staying motivated and curious about your job is essential. Plus, it’s also crucial to apply ethics and posting appropriate quotes, articles, and the like that won’t put a company in jeopardy. My inspiration comes from a blog by Marc Andreessen and so I would love to share his 3 most important hiring criteria. What Marc means by ‘drive’ is self-motivation. It’s a bit theoretical in some ways, but you’ll know it when you see it. So when he’s looking at someone’s background, for instance, he’s looking for what someone’s done. Not what they’ve been involved in, not what they’ve been a part of, not what they’ve seen from the sideline – but what they’ve actually done. Curiosity is something that is evident in a job that you love. I think it comes very naturally that if you love something you’re curious about it, you want to know more about it, read about it, study it, and talk to other people about it. For someone who is super into social media, curiosity is a very good indicator of potential success of that employee. This one is a bit obvious and probably the deal-breaker trait. If you’re not an ethical person by nature it probably won’t work out long term. This is especially true in a social media position because it is so public-facing. Do you have enough knowledge of content marketing? If so, Mashable says you should have editorial skills as well. That means understanding the process and staying up to date with it, as Brian Honigman points out. I’m not going to sugarcoat it. This is not a “should,” it’s a “must.” Content marketing is not just a fad. It’s upending the entire ad business. For most of advertising history, ads have supported outside media by paying for the privilege to interrupt it. In the past five years, brands have realized that they can circumvent this whole system by simply creating their own media and benefiting from association. This ability to create content is going to make or break brand’s entire advertising departments, but social media will be ground zero. Social media is the distribution platform that makes content marketing a viable strategy. And the social media manager acts as a gatekeeper and guide for content efforts. You must understand the editorial process to do this role well. There’s no getting around it. In addition to editorial skills, AdWeek mentions online communications as another job quality companies prefer. Having experience in online communications goes far when it comes to looking to hire the best person for the job. Just because someone is 19 and came of age using Facebook in his personal life does not mean that he can manage and implement your online communities on social media sites successfully. Untrained interns were fine two or three years ago, when the Social Web was still in its infancy and everyone was experimenting. But that era is over. The truth is, in terms of results in social media, you get what you pay for, and if you want the best person for the job, you need someone who has at least a year or two of professional experience in Web 1.0. Kruse Control also mentions focus as being an essential marketing skill. Being able to concentrate and not get distracted by a social media trend that may pop up on your feed while marketing for a client is essential. There is a fine balance between engaging and getting distracted by things that are not beneficial to a company. Focus is fast becoming an essential marketing skill. Amid the many distractions facing social media managers, the ability to concentrate has become increasingly complicated. We lost focus to social media, which has made interruption an art and science. The very medium we work in has provided so many distractions that it’s a gigantic task just to keep track of what we were doing 15 minutes ago. From meetings to conference calls to compliance training to social community management, the sheer deluge of interruptions is a poopocalypse, crying out for critically acclaimed leadership. Until then, focus remains an individual skill the modern marketer must strive to master. The fundamental role of a social media manager is to understand a brand’s audience as deeply as possible with a special focus on how they communicate. Being exceptional at this requires a very high degree of empathy and the ability to understand the audience — including their tastes and habits — even if these are fundamentally different than their own. In order to be a part of the conversation and ultimately affect its direction, you have to be able to think, feel and act like a member of the organic audience. We find that the best social media manager’s are those who talk to the team to feel out their audience and community, and use those learnings to drive results. Social Media Today suggests that it’s hard to perform well in a job if the person isn’t passionate about it. That’s why if you’d like to pursue a career as a social media manager make sure it’s something that interests you and that you’re willing to grow in. Without passion, it’s hard to be innovative and eager to do the job well. Exactly what they are passionate about can and will vary, but they need to be able to tie into their passions, and those of their communities. They enjoy social media and enjoy their job and the work they do, and it is evident through their communications. To get other people excited about something (i.e. your brand!) you need your social media staff to be just as excited. Excitement is contagious!